In the last few years, a phenomenon known as ‘begpacking’ has been plaguing countries like Thailand, Vietnam, and the majority of Southeast Asia. Travellers, typically from western countries, arrive in these countries as a part of their journey across the world. Most short-term visas do not allow visitors to work so they quickly run out of their own money. 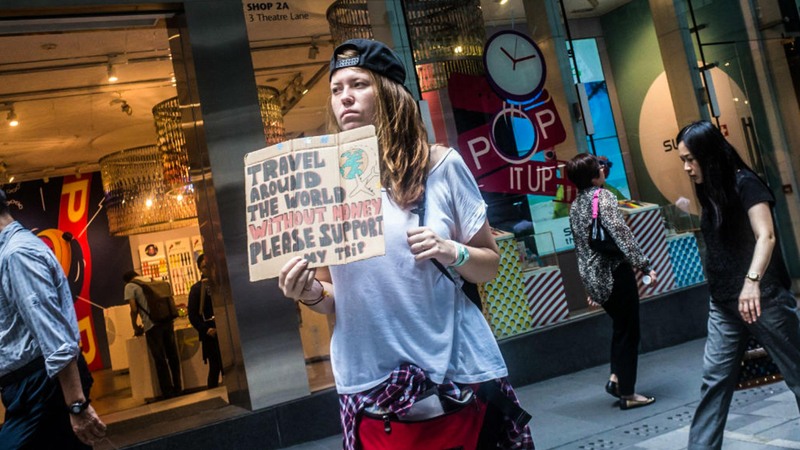 Instead of making the trek back home before they go completely broke, begpackers choose to ask for money on the side of the street to fund their travels. Unlike foreign travellers that provide a service when begging such as busking, selling crafts or live art, begpacking has no merit. Going to a foreign country and begging its locals for money to fund your trip of “enlightenment” is like a bat symbol of privilege. The mere ability to jump on a flight across the world is a privilege. A privilege that many of the locals these begpackers take money from may never have the luxury to do. When begpackers choose to “rough it” they are displacing the poor in these countries and disrupting resources that should flow to them (meals for homeless, free showers, etc). It is extremely disrespectful to the citizens of those countries and takes advantage of their hospitality. What’s worse is that begpackers know exactly what they’re doing. At any time, most begpackers have the ability to forego their facsimile of struggle and travel back home where they can post their adventures on Instagram and be heralded by their followers as a guru’s of cheap exploration. As Rosie Spinks points out in her QZ article, ‘begpacking’ is a status symbol. People are so wealthy that they enjoy the ability to go through a diluted version of poverty so that they can seem more cultured to the rest of their affluent community. While many begpackers fit this description, there are a few exceptions. Viola Gaskell outlines the story of a Ukranian traveller named Alex who was on holiday in Hong Kong and had all of his belongings stolen in her article on HKFP. He was forced to beg in order to find a way home but eventually had to result to hitchhiking. A lot of the defence for begpacking focuses on this anomaly. Helen Coffey, a writer for The Independent, has appeared on BBC News in defence of begpacking and why she “refuses to judge westerners” that are participating in the trend. Her point of view focuses on the potential for any begpacker to be a victim of actual hardship. And it is true that not all people begging on the street are begpackers. However, it is also true that begpacking has become a phenomenon in the past few years that is negatively affecting the countries it is present in. And would a phenomenon arise out of random unfortunate events that occur to a small number of travellers? Unlikely. People like Helen Coffey are focusing on what the issue is not, which provides an unfounded justification for westerners that want to travel this way. Whilst it is important to acknowledge that some travellers are thrust into unfortunate circumstances that cause them to beg, it must be understood that it is vastly different from self-chosen begpacking. If the travellers really had no money, they would have never gotten across the world in the first place. In order to alleviate this issue, countries like Thailand are more strictly enforcing laws that require visitors to prove they have a certain amount of money with them upon entry. The solution is simple however, if you don’t have enough money to travel through all of these countries, don’t go yet. There are many ways to travel the world on a budget and if you work for it and save your money, odds are you will be able to work it out. Alternatively, there are also a lot of countries that provide working holiday visas. While the stay is generally longer, it allows you to go to a country and work to earn your keep. Many people are able to travel to surrounding areas or countries as well, and it remains a much more respectable and considerate way to see the world than begpacking. If you’re still on the fence about what to think, check out this video by SAYS writer and social activist Nandini. It concisely explains the injustices of begpacking and its detriment to local communities.